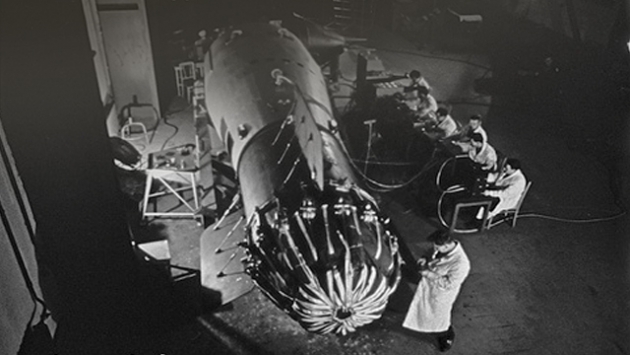 22 November 1955: The Soviet Union’s first thermonuclear weapon, RDS-37, was air-dropped at the Semipalatinsk Test Site, approximately 150 kilometers west of the city of Semipalatinsk, Kazakh S.S.R. (now, Kazakhstan). The bomber, a Tupolev Tu-16A, and its crew were under the command of Senior Test Pilot Major Fedor Pavlovich Golovashko. Major Golovashko and his crew had made a previous attempt with the RDS-37. Two days earlier, 19 November, the loading of the bomb began at 6:45 a.m. Four hoists were used to lift it into the bomber’s weapons bay. The process took about two hours. 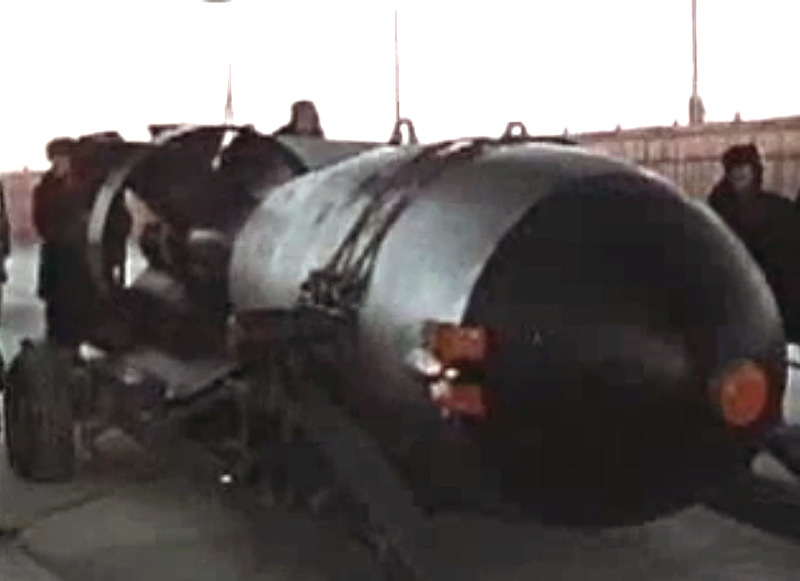 In this still frame from a cine film recording, the RDS-37 bomb is shown being positioned under the Tupolev Tu-16A bomber for loading into the bomb bay. At 9:30 a.m., the Tu-16 took off from Zhana Semey Airport (PLX), about 8 kilometers (5 miles) south of the city of Semipaltinsk. It began climbing to an altitude of 12,000 meters (39,370 feet) as it flew toward the test site. Golovashko’s bomber was escorted by pairs of Mikoyan-Gurevich MiG-17 fighters to prevent the theft of the test weapon. Although the weather had been forecast to be good, it unexpectedly began to deteriorate. The Tu-16 was above a cloud layer with the test area obscured. As the crew prepared to bomb by radar, the radar equipment failed and all attempts to repair it were unsuccessful. Test conductors were very concerned about landing the Tupolev back at Semipalatinsk with a fully-armed nuclear bomb still on board. There was consideration of dropping the RDS-37 over remote mountains, but there was no certainty of being able to avoid villages or towns, and if the bomb were to only partially detonate there could be widespread contamination by its radioactive fuel. There was a delay in making a decision and the Tupolev’s fuel was getting low. Finally it was decided to have the bomber return to Semipaltinsk with the bomb. The landing was uneventful and the technicians removed the RDS-37 for servicing before the next test attempt. It was normal procedure for bomber crews to rotate, but the decision was made to have Major Golovashko’s crew make the second test flight. On 22 November the weapon loading began at 4:50 a.m., with takeoff at 8:34 a.m. Again the Tupolev Tu-16A was escorted by pairs of MiG-17s. Once again, the bomber arrived over the test site at 12,000 meters, flying at 870 kilometers per hour (541 miles per hour). After being released from Major Golovashko’s Tupolev, the RDS-37 was retarded by parachute to allow time for the bomber to get away. It detonated at 1,550 meters (5,085 feet) above the ground. The flight crew described seeing a blue-white flash that lasted 10 to 12 seconds. The shock wave of the detonation, spreading at the speed of sound, hit the bomber 3 minutes, 44 seconds after the drop. The Tu-16 experienced accelerations of 2.5Gs, and was lifted to higher altitude. It was not damaged. 5–7 minutes following the detonation the distinctive mushroom cloud had reached to a height of 13–14 kilometers (8–8.7 miles) and its diameter was 25–30 kilometers (15.5–18.6 miles). The RDS-37 detonated with a reported yield varying between 1.6 and 1.9 megatons (depending on source). The bomb had a designed yield of 3 megatons but this had been intentionally reduced for this test. The bomb detonated under a temperature inversion layer which reflected a large proportion of the explosive force back to the ground. A small town about 75 kilometers (47 miles) away suffered significant destruction. A small child was killed when a building collapsed. At another location, a soldier in an observation was killed when the trench caved in from the shock. Nearly 50 others were injured. Windows were broken as far as 200 kilometers (124 miles) away. Several videos of this test are available on YouTube. The Tu-16 has a normal bomb load of 3,000 kilograms (6,614 pounds), but can carry up to 9,000 kilograms (19,842 pounds). It has seven Afanasev Makarov AM-23 23mm autocannons for defense, mounted in three pairs which are remotely operated by the gunners, and a single gun in the nose. These guns fire at a rate of 900 rounds per minute. The Tupolev Tu-16 was built in bomber, cruise missile carrier, electronic counter measures, aerial tanker, and electronic and photographic reconnaissance versions, at three factories in the Soviet Union: Kazan Plant N22, Kuibyshev N18 and Voronezh N64. 1,507 Tu-16s were built before production ended in 1961. 453 of these were the Tu-16A nuclear weapons version. Another 120 were built under license in China by Harbin Aircraft. These are designated H-6. 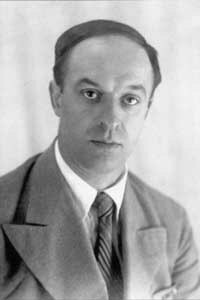 Fedor Pavlovich Golovashko was born at Byokovo, Novosibirsk, 22 June 1923. He was educated through the 9th grade before being drafted into the Soviet Army in 1941. He was trained as a pilot at the Novosibirsk Military Aviation School, graduating in 1943. He was assigned to a Long Range Aviation regiment (Dalnyaya Aviatsiya) under the command of Alexander Ignatyevich Molodchy, twice a Hero of the Soviet Union. 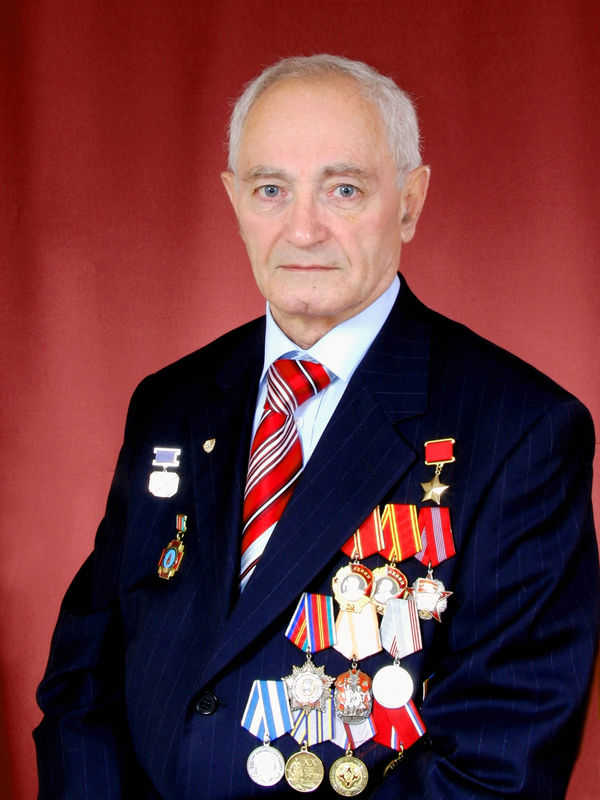 Golovashko’s final missions of the Great Patriotic War (World War II) were flown against Berlin. 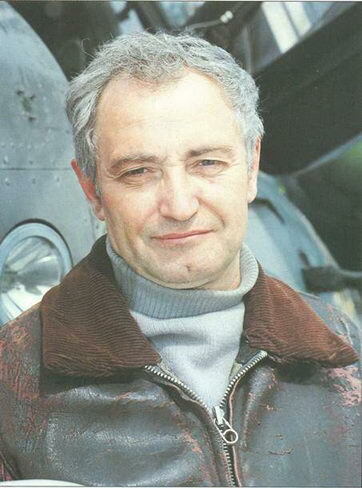 Fedor Golovashko remained in the Air Force following the war and soon was in command of a squadron. He became a test pilot in 1954 and was assigned to the Semipalatinsk Test Site. Senior Test Pilot Major Fedor Pavlovich Gorovashko was named a Hero of the Soviet Union, 11 September 1956. He reached the rank of Colonel before retiring from the Air Force in 1961. He had been awarded the Order of Lenin, Order of the Red Banner (two awards), Order of the Patriotic War 1st Degree, and the Order of the Red Star (two awards). After retiring, Colonel Golovashko lived in Odessa. He died there, 19 April 1981. Major Golovashko’s bomber was a Tupolev Tu-16A (NATO codename “Badger-A”). 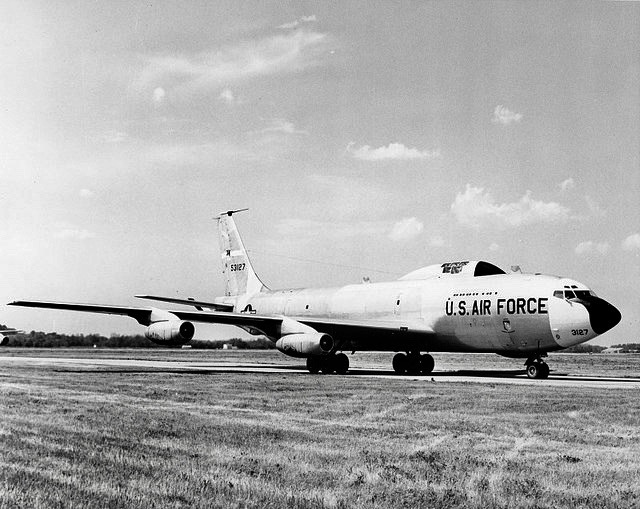 This was a two-engine turbojet-powered long-range medium bomber. It was normally operated by a flight crew of seven. Developed from the Tupolev Design Bureau Project 88, the prototype Tu-16 made it’s first flight at Zhukovsky Airfield (Ramenskoye Airport), southeast of Moscow, on 27 April 1952. 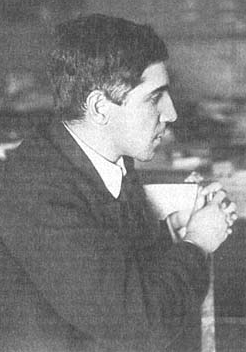 The test pilot was Nikolai Stepanovich Rybko. This was the Soviet Union’s first swept-wing bomber. It was designated Tu-16 and entered production in 1954. 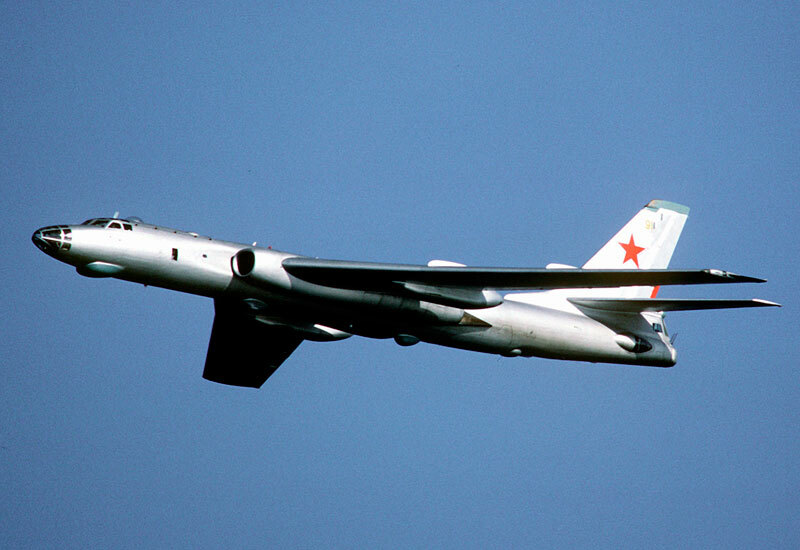 The Tu-16A was designed specifically to carry nuclear weapons and had a strengthened fuselage and heated bomb bay. The Tupolev Tu-16 is 34.8 meters (114.2 feet) long with a wingspan of 33 meters (108.3 feet) and overall height of 10.36 meters (34 feet). The wings are mounted at mid-fuselage and have a compound sweep. The inner portion has a leading edge sweep of 40.5°, and the outer wing is swept to 35°. t has an empty weight of 37,200 kilograms (82,012 pounds) and maximum takeoff weight of 79,000 kilograms (174,165 pounds). Power is supplied by two large turbojet engines mounted in the wings at the fuselage, similar to the de Havilland Comet, though they are angled slightly outward to direct the exhaust away from the airplane’s skin panels. The Tu-16A variant is equipped with two Mikulin RD-3M-200 turbojets which produce 21,835 pounds of thrust, each. The Tu-16A has a maximum speed of 992 kilometers per hour (610 miles per hour) and a service ceiling of 12,800 meters (41,995 feet). Its maximum range is 6,400 kilometers (3,977 miles). Tupolev Tu-95V No. 5800302 carrying the RDS-220 bomb. 30 October 1961: At 9:30 a.m., specially modified Tupolev Tu-95V “Bear A” bomber, No. 5800302, under the command of Major Andrey Ergorovich Durnovtsev of the 409th Heavy Bomber Air Regiment, departed Olenegorsk Air Base, 92 kilometers (57 miles) south of Murmansk, at 9:30 a.m. 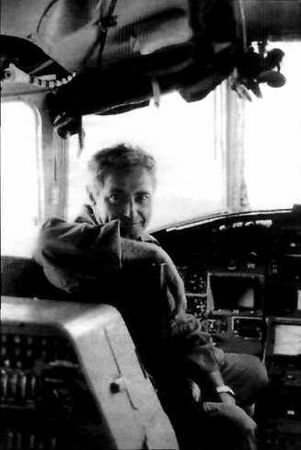 The bomber carried a nine-man crew, including navigator Major Ivan Nikoforovich Mite. 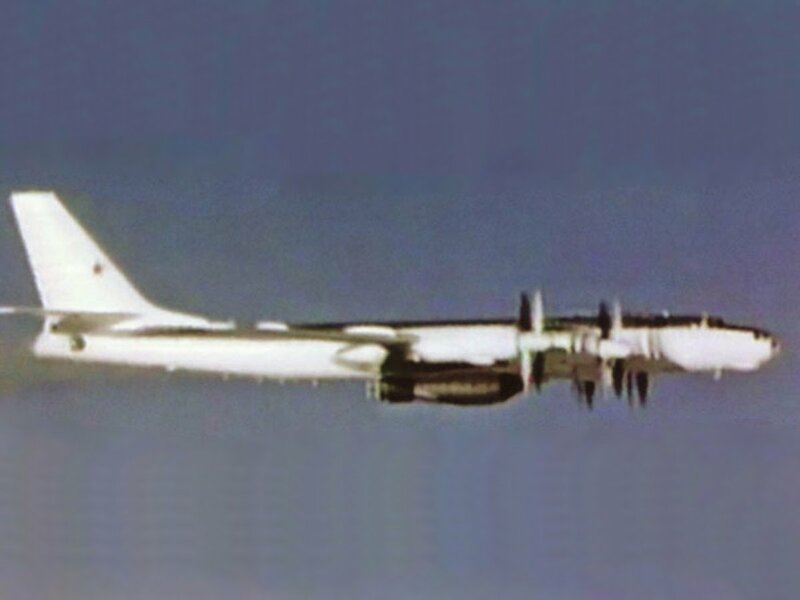 The Tu-95 was accompanied by a Tupolev Tu-16 instrumentation ship (No. 3709), under the command of Colonel Vladimir Fedorovich Martynenko. Some sources say that the two bombers were escorted by a flight of fully-armed fighters. Major Durnovtsev’s mission was to carry out the Soviet Union’s 130th nuclear weapons test. 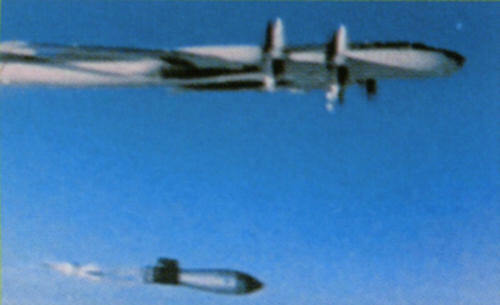 The Tu-95 carried a single RDS-220, a three-stage radiation-implosion thermonuclear bomb. It was 8 meters (26.25 feet) long, with a diameter of 2.1 meters (6.89 feet), and weighed approximately 27,000 kilograms (59,525 pounds). The bomb was variously known as “Big Ivan” or “Tsar Bomba” (King of Bombs). Fully assembled RDS-220 three-stage radiation implosion thermonuclear bomb, with retarding parachute in place, at Arzamas-16 . The Tu-95 dropped the RDS-220 from an altitude of 10,500 meters (34,449 feet) over the D-II test range, 15 kilometers (9 miles) north of the Mityushikha Strait on Novaya Zemlya. The bomb was retarded by parachute to allow the Bear time to escape the blast effects. After falling for 3 minutes, 8 seconds, at 11:33 a.m., the bomb detonated 4,000 meters (13,123 feet) above the surface of Novaya Zemlya. A bright flash of light lasted for 30 seconds and finally faded away after 70 seconds. 45 seconds after detonation, the nuclear cloud reached a height of 30 kilometers (19 miles), then spread outward, reaching a maximum diameter of 95 kilometers (59 miles). 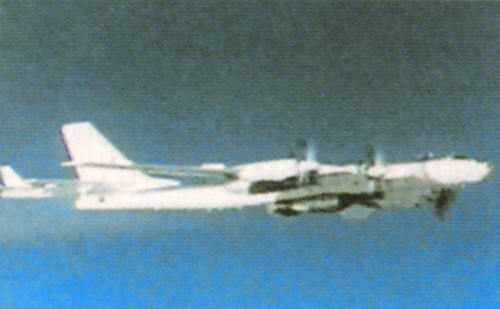 Major Durnovtsev’s Tupolev Tu-95V “Bear A,” carrying the RDS-220 bomb to the target. A Tu-16 instrumentation aircraft is just behind, on the bomber’s left quarter. 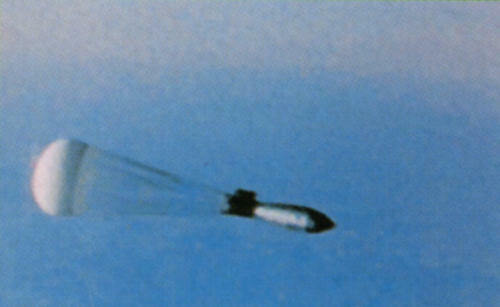 The RDS-220 bomb just after drop. The retarding parachute is beginning to deploy. 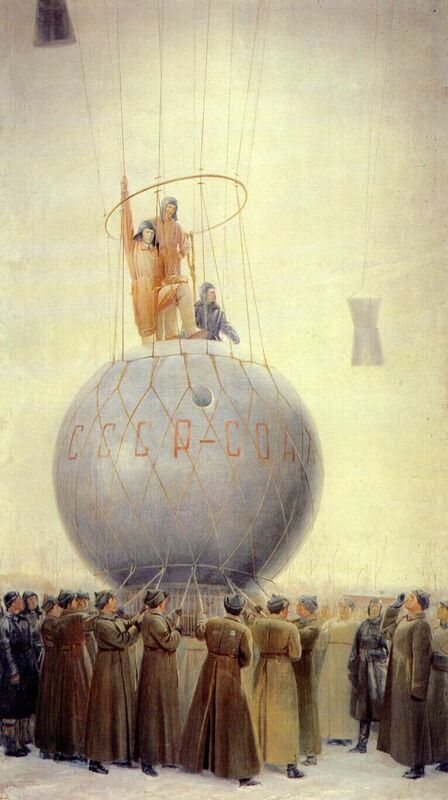 “Big Ivan” with first stage parachute deployed. Major Durnovtsev’s Tu-95 was approximately 39 kilometers (24 miles) away for “ground zero” at the time of the explosion. As it continued to fly away from the blast, the shock waves finally caught up to bomber at a distance of 115 kilometers (71 miles), 8 minutes, 20 seconds after they had released the bomb. Speed Light Bravo, Boeing JKC-135A Stratotanker 55-3127. After the nuclear explosion data was analyzed by the Foreign Weapons Evaluation Panel (the “Bethe Panel”) the RDS-220 yield was estimated at 57 megatons. This was the largest nuclear weapon detonation in history. It was also the “cleanest,” with 97% of the energy yield produced by fusion. Relative to the size of the explosion, very little fallout was produced. 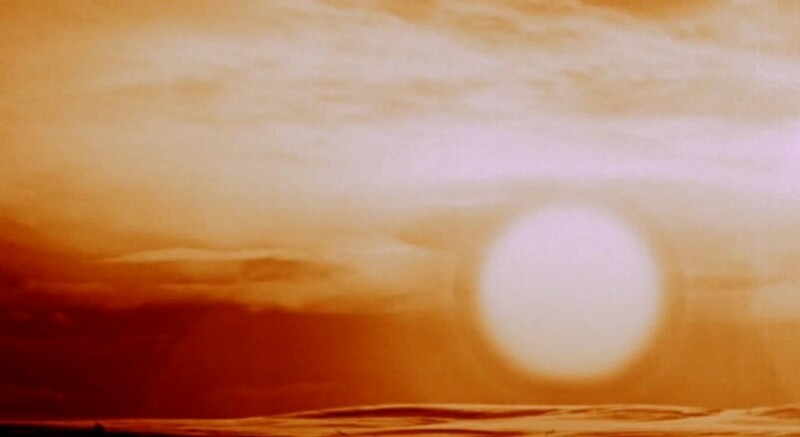 Tsar Bomba fireball over Novaya Zemlya, 11:32 a.m., 30 October 1961. The fireball has reached a diameter of 5 miles (8 kilometers). Shock waves reflecting off of the ground caused the slight flattening of the bottom of the fireball. All buildings in the town of Severny, 55 kilometers (34.2 miles) from Ground Zero, were destroyed. Wooden buildings as far as 200 kilometers (124 miles) were destroyed or heavily damaged. A visible shock wave in the air was seen at a distance of 700 kilometers (435 miles). The shock wave from the explosion traveled around the world three times. 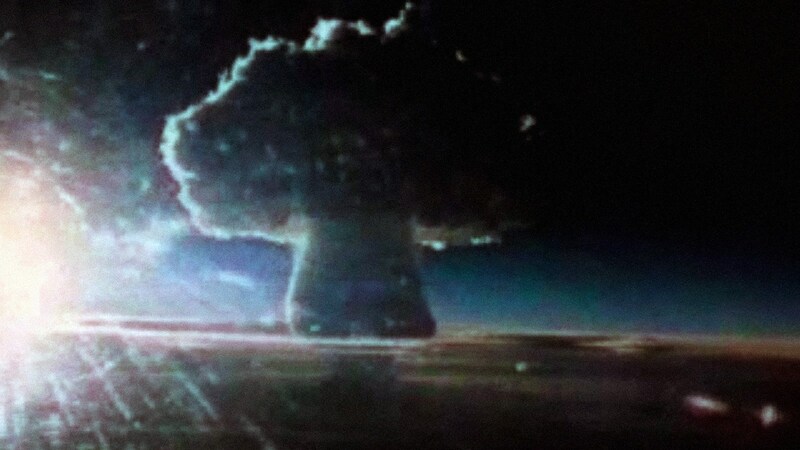 The mushroom cloud of Tsar Bomba climbs into the stratosphere. 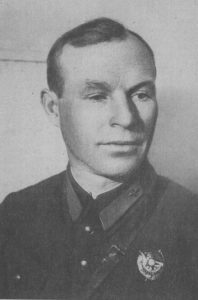 Following the test, Major Durnovtsev was promoted to the rank of Lieutenant Colonel and named Hero of the Soviet Union. 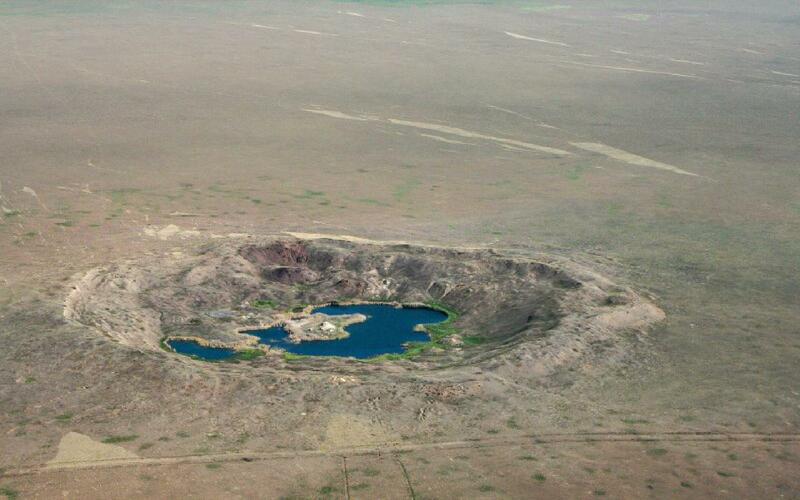 The crater created by the Tsar Bomba test, 30 October 1961. Bear No. 5800302 was ordered in 1955 and completed in 1956. The Tupolev Tu-95 is a long range strategic bomber. It is 151 feet, 6 inches (46.2 meters) long with a wingspan of 164 feet, 5 inches (50.10 meters). The wings are swept at a 35° angle. The bomber is powered by four Kuznetsov NK-12M turboprop engines, producing 14,800 shaft horsepower, each, and turning 8-bladed counter-rotating propellers. It weighs 90,000 kilograms (198,416 pounds) empty, with a maximum takeoff weight of 188,000 kilograms (414,469 pounds). The Bear has a maximum speed of 920 kilometers per hour (572 miles per hour) and an unrefueled range of 15,000 kilometers (9,321 miles). (The Bear A is capable of inflight refueling.) Service ceiling is 13,716 meters (45,000 feet). Approximately 72 of these aircraft remain in service with the Russian Federation. The current variant is the Tupolev Tu-95MS “Bear H.” Recently, individual bombers have been taken out of service to be modernized by the Beriev Aircraft Company at Taganrog, Russia. The modernized Bear is designated Tu-95MSM. It is expected that 20 Tu-95s will be upgraded. Андрей Егорович Дурновцев (Andrey Ergorovich Durnovtsev) was born 14 January 1923 at Verkhney, a village in the Krasnoyarsk Krai of Siberia. He graduated from high school in 1940. 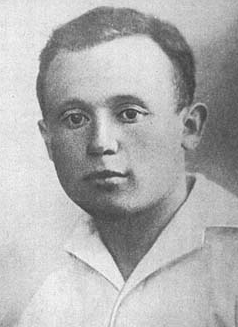 Durnovtsev was inducted into the Red Army 19 July 1942 and sent to the Irkutsk Military School of Aviation Mechanics, graduating in November 1943. He was promoted to sergeant. Sergeant Durnovtsev request assignment for pilot training, and was sent to the 8th Military Aviation School for initial flight training. In August 1945, he was sent to complete training in long-range bombers at the Engels Military Aviation Pilot School (VAUL). He graduated in 1948. 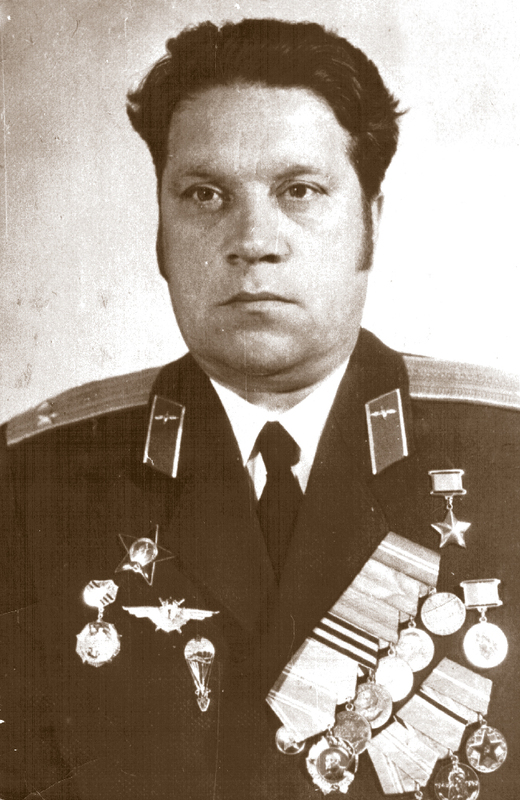 Lieutenant Durnovtsev next attended the Ryazan Higher Officers’ School, studying the combat application of long-ranger bombers. He was assigned as a pilot with the 330th Bomber Aviation Regiment. Durnovtsev served as an aircraft commander, detachment commnder, then deputy squadron commander. 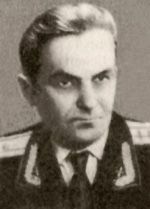 Lieutenant Colonel Drnovtsev retired in 1965. 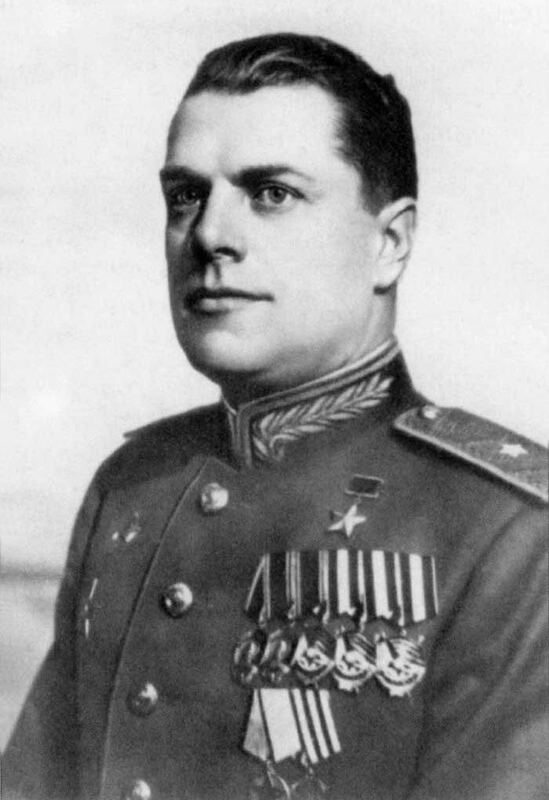 During his military career, he had been awarded the Gold Star Medal, the Order of Lenin, the Order of the Red Star, and the Medal for Military Merit. 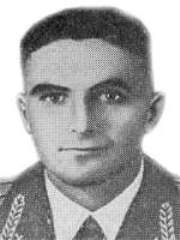 Lieutenant Colonel Andrey Ergorovich Durnovtsev, Hero of the Soviet Union, died in Kiev, 24 October 1976, at the age of 53 years. 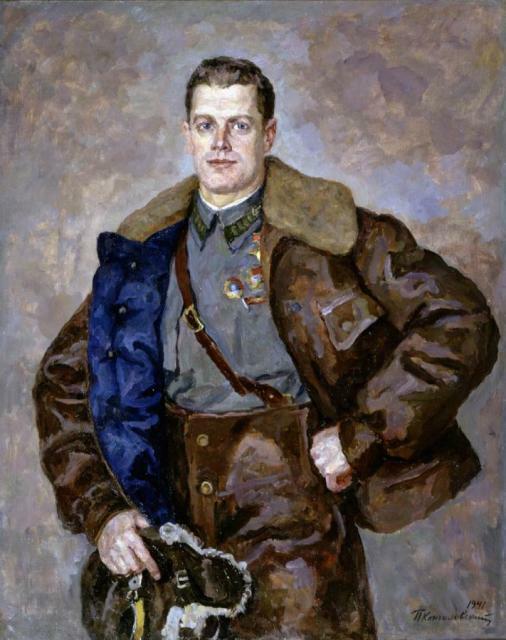 “Portrait of a Hero of the Soviet Union, Pilot A.B. Yumashev,” by Pyotr Konchalovsky, 1941. Oil on canvas, 140 x 111 cm. Russian Museum, St. Petersburg, Russia. 28 October 1936: Flying a four-engine Tupolev TB-3 bomber near Tchelcovo, U.S.S.R., Юмашев Андрей Борисович (Andrey Borisovich Yumashev, A.B. Yumashev, A. Youmachev, André Youmacheff), with a crewman named Kalachnikov, set a Fédération Aéronautique Internationale (FAI) World Record for Altitude With a 5,000 Kilogram (11,023 pounds) Payload, reaching 8,980 meters (29,462 feet).¹ This was the fourth world altitude record set by Yumashev with the TB-3. 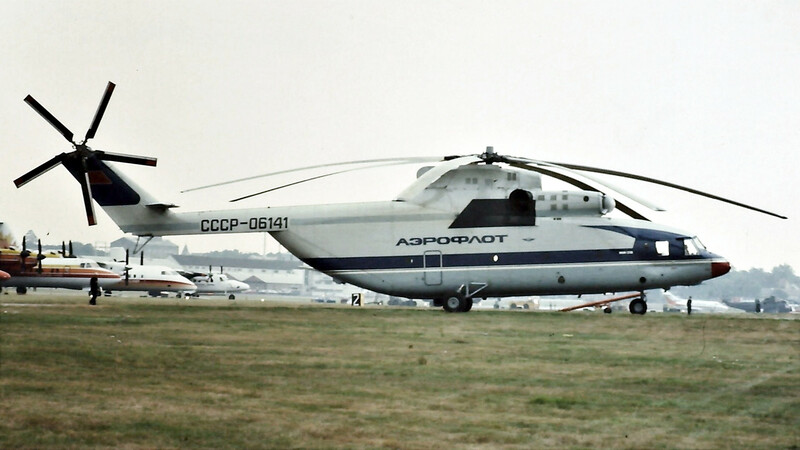 The transport variant of the Tupolev TB-3 is identified as the ANT-6. For the 28 October flight, Yumashev’s airplane was powered by four air-cooled, supercharged, 30.104 liter (1,837 cubic inches) Shvetsov ASh-62 nine-cylinder radial engines, rated at 1,000 horsepower at 2,200 r.p.m., each. This engine was developed from the earlier Shvetsov M-25, which was a license-built version of the Wright Aeronautical Corporation R-1820 Cyclone. 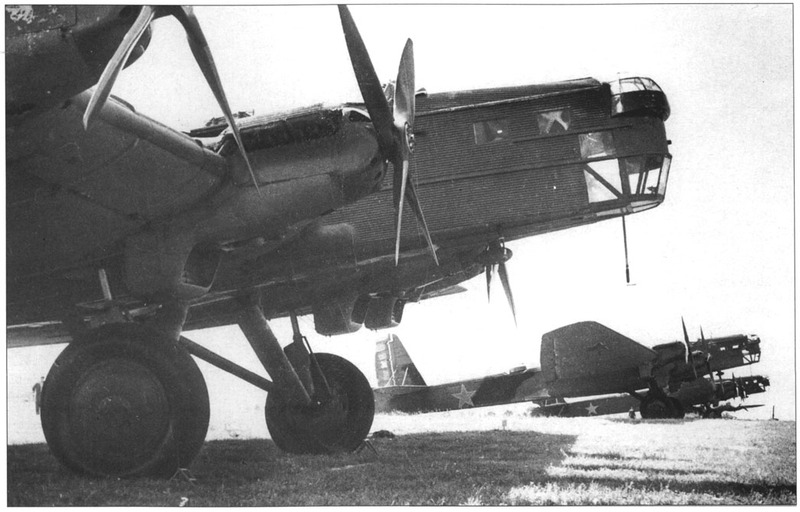 Soviet Air Force Tupolev TB-3 heavy bombers. 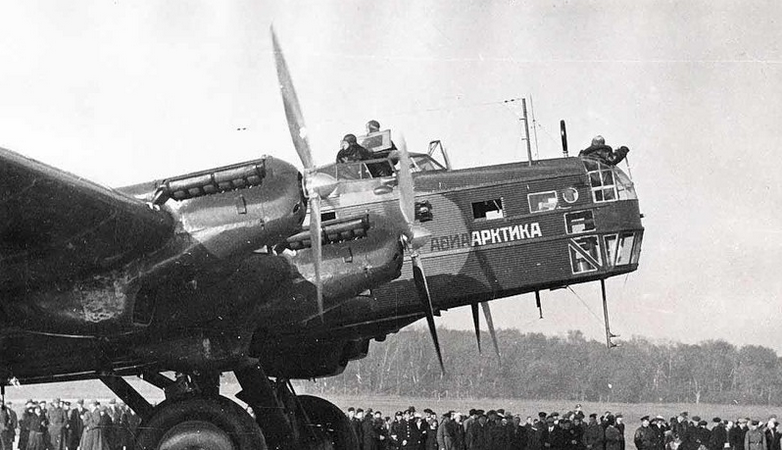 The Tupolev TB-3 was a four-engine heavy bomber built of a steel framework with corrugated steel skin panels. It had fixed landing gear. Initially, each main gear supported two wheels in a bicycle configuration. This was later changed to a single wheel and tire. While most were powered by liquid-cooled V-12 engines, various combinations of propellers were used. Some airplanes used wooden two-bladed propellers, while some used four-bladed propellers on the inner two engines. Later bombers used four-bladed propellers on all engines, while some ANT-6 transports used metal three-bladed variable-pitch propellers. The first prototype had flown in 1930 and the TB-3 was in service until 1939, by which time it was obsolete. There were still more than 500 when the Great Patriotic War began in 1941. In addition to service as a heavy bomber, it also flew cargo and was a paratroop transport. Tupolev ANT-6-4AM-34RVN, No. 209, “Aviaarktika,” modified for an August 1937 polar expedition. The airplane and its six-man crew disappeared. Major General Andrey Borisovich Yumashev was born at St. Petersburg, Russian Empire, in March 1902. He entered the army in 1918, serving with artillery units. In 1924 he trained as a pilot, serving as a combat pilot until 1927 when he became a test pilot at the Research and Testing Institute of the Air Force. Over the next ten years he tested fighters, bombers, and transports, and was appointed Test Pilot First Class. Yumashev flew the Ilyushin DB-3 long-range bomber during the Soviet Finnish War of 1940 (“The Winter War.”) During the Great Patriotic War, he commanded the 2nd Independent Fighter Aviation Squadron in defense of Moscow, then the 237th Fighter Regiment at the Kalinin Front. He served as deputy commander of the 3rd Air Force at the Kalinin Front and then the 1st Air Army on the Western Front. By the spring of 1943, he was in command of the 6th Fighter Air Corps at the Central front. By 1944, General Yumashev commanded the Eastern Front Air Defense and the Southern Front Air Defense. He participated in the attacks against Königsberg and Berlin at the end of World War II. A. 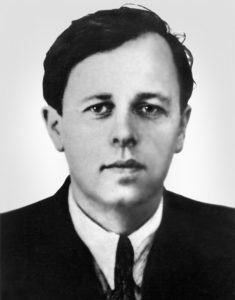 B. Yumashev retired from the Soviet military in 1946. He then went on to become an accomplished artist. During his military service, General Yumashev was named Hero of the Soviet Union, twice was awarded the Order of Lenin, and five times the Order of the Red Banner. He was also awarded the Order of the Red Star. 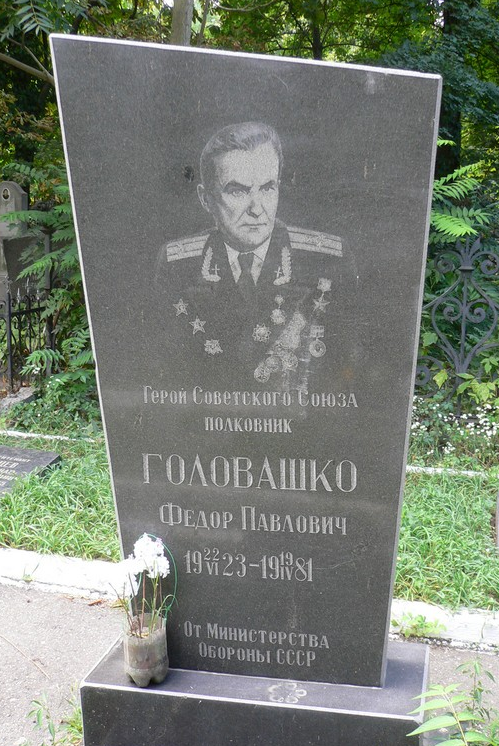 Major General Andrey Borisovich Yumashev died at Moscow, Russia, U.S.S.R., 20 May 1988.